OK, this recipe is the most decadent, delicious and delightful dessert recipe you’re likely to find here on DRB. The Queen (it’s all her fault) brought this recipe home from someone who brought these little devils to a church potluck. You may know those church potluck cooks…they feel no guilt making their most delectable, diet-wrecking, downright tasty dishes to church potlucks when they’d never make them for their foodie friends. God love ’em. Anyhow, let’s say you are looking for a pretty-easy dessert you can serve to anyone (who’s not diabetic) and get a “Wow, this is fantastic!” reaction. OK, get ready…. Press the mixture into an UNGREASED 9×13 Pyrex® glass pan (or metal if you don’t have one). Take your time to try and press the crust to an even thickness all over…makes a difference at the finished-product level. Melt the butter in a 2-cup measuring container in the microwave (or in a minimum two cup sauce pan on the stove) and let cool for about 5 minutes. Using the same bowl as above, wiped out pretty clean, combine the brown sugar and corn syrup with a fork until thoroughly blended. Add the vanilla and salt to the egg-butter liquid and combine thoroughly with the sugar-corn syrup in bowl. Chop and stir in the pecans until distributed evenly. Bake at 350° for 30 minutes (more or less depending on your oven). You can start checking at 25 minutes. What you’re looking for is that the center is “set”…it doesn’t look liquidy any more. Don’t worry too much about this. As long as the thing doesn’t get burned, it will be good. Remove from oven and let cool. After a few minutes, loosen the mixture from the edge of the pan by working a sharp knife all the way around the pan. When completely cool, cut into bars. Should make one or two dozen or more depending on how many you need or the sweetness tolerance of your audience. Enjoy! You are looking very impressive to your friends! 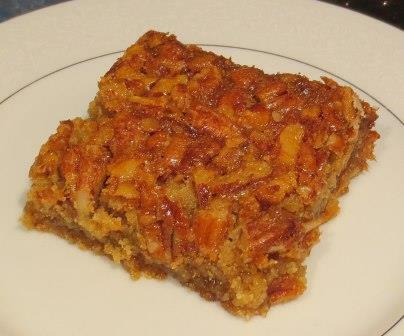 These bars are great eaten by hand (slightly gooey) or served up fancy on a plate with whipped cream or vanilla ice cream. They keep very well if you keep the air away. Should be eaten at room temp.